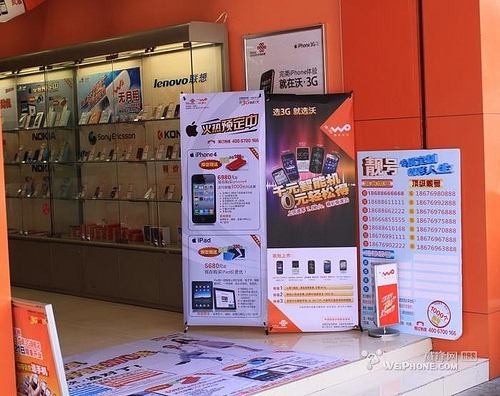 China Unicom, which happens to be the only official and authorized carrier in the world’s largest cellphone market (China) for iPhones and iPads is going to provide full service to its customers, which includes jailbreaking, converting SIM Card to Micro-SIM, installation of 10 of the most popular apps from Cydia, and a free case on every new purchase of iPhone 4 and iPad 3G. This was spotted by a Chinese citizen on a large advertising banners outside some of the China Unicom’s stores, as can be seen in the images below. Just so you know, there’s no mention of Cydia apps in there, only jailbreaking. Maybe Installous apps? What are the 10 most popular apps from cydia ? what happens if it comes out as a factory jailbroken iphone that remains jailbroken no matter what O_O . I can;t find unicom’s trademark/logo is the banner ad. Is it the official release? it just mentioned that the will install top 10 hottest app but it did not mention the app is cydia app. why to go Unicom !! And, if they are going to use, say, Jailbreakme, who’s going to pay Comex for that? And how much do comex going to charge for that? Or better still, let them just use jaiobreakme and get a huge lawsuit later on since they apparently don’t think they should lisence the technology first… Indeed, very interesting to see how it develops. Ah soggybacon, if you look again you will see the cydia mention right there in front of your face!! Dummy. ( 10 of the most popular apps from cydia ). 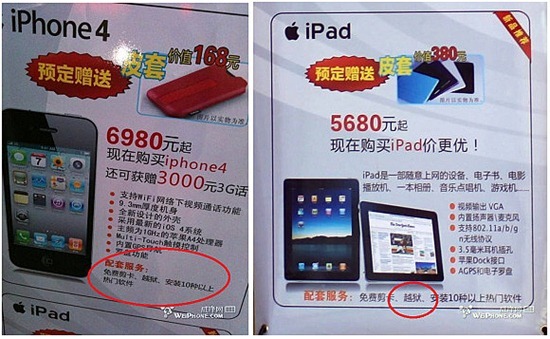 its a promotion from A store not in the whole China! Maybe its a Hong Kong model brought in and is being sold! Still waiting in Shanghai!